The temple is located near Sikkal, Keevalur . The Moolavar is Loganathan seen in standing posture facing east (Shyaamalameni Perumal). The Utsava murtis are Damodara Narayanan, Aravindavalli. Access to the temple About a mile east of Keevalur Station(near Nagappatinam). Prefer to hire a car or taxi from the station up to the temple. There are no known bus services available. Features This is a " Krishnaranya " Kshetra. The Moolavar of this kshetram is Loganathan. Also named as Shyamalameni Perumal . The Moolavar is giving his seva in the standing posture facing east. 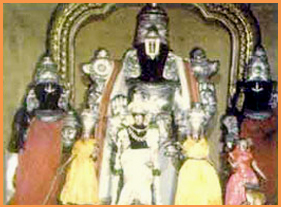 Prathyaksham for Bhrigu Maharishi, Brahma devan, Uparisaravasu, Gowtha Marishi, Thirumangai Alwar . This temple lies on the Tanjore district of Tamil Nadu. It's about 2 kms away from Keevalur Railway station. In Naagapatinam to Sikkal (or) Keevalur bus route alight at Aazhiyur stopping and from there its 3/4 kms away arrangements for staying is not possible.